This article is about the branch of physics and astronomy. For other uses, see Cosmology. "Cosmic Evolution" redirects here. For the book by Eric Chaisson, see Cosmic Evolution (book). Modern cosmology developed along tandem tracks of theory and observation. In 1916, Albert Einstein published his theory of general relativity, which provided a unified description of gravity as a geometric property of space and time. At the time, Einstein believed in a static universe, but found that his original formulation of the theory did not permit it. This is because masses distributed throughout the universe gravitationally attract, and move toward each other over time. However, he realized that his equations permitted the introduction of a constant term which could counteract the attractive force of gravity on the cosmic scale. Einstein published his first paper on relativistic cosmology in 1917, in which he added this cosmological constant to his field equations in order to force them to model a static universe. The Einstein model describes a static universe; space is finite and unbounded (analogous to the surface of a sphere, which has a finite area but no edges). However, this so-called Einstein model is unstable to small perturbations—it will eventually start to expand or contract. It was later realized that Einstein's model was just one of a larger set of possibilities, all of which were consistent with general relativity and the cosmological principle. The cosmological solutions of general relativity were found by Alexander Friedmann in the early 1920s. His equations describe the Friedmann–Lemaître–Robertson–Walker universe, which may expand or contract, and whose geometry may be open, flat, or closed. In the 1910s, Vesto Slipher (and later Carl Wilhelm Wirtz) interpreted the red shift of spiral nebulae as a Doppler shift that indicated they were receding from Earth. However, it is difficult to determine the distance to astronomical objects. One way is to compare the physical size of an object to its angular size, but a physical size must be assumed to do this. Another method is to measure the brightness of an object and assume an intrinsic luminosity, from which the distance may be determined using the inverse square law. Due to the difficulty of using these methods, they did not realize that the nebulae were actually galaxies outside our own Milky Way, nor did they speculate about the cosmological implications. In 1927, the Belgian Roman Catholic priest Georges Lemaître independently derived the Friedmann–Lemaître–Robertson–Walker equations and proposed, on the basis of the recession of spiral nebulae, that the universe began with the "explosion" of a "primeval atom"—which was later called the Big Bang. In 1929, Edwin Hubble provided an observational basis for Lemaître's theory. Hubble showed that the spiral nebulae were galaxies by determining their distances using measurements of the brightness of Cepheid variable stars. He discovered a relationship between the redshift of a galaxy and its distance. He interpreted this as evidence that the galaxies are receding from Earth in every direction at speeds proportional to their distance. This fact is now known as Hubble's law, though the numerical factor Hubble found relating recessional velocity and distance was off by a factor of ten, due to not knowing about the types of Cepheid variables. Given the cosmological principle, Hubble's law suggested that the universe was expanding. Two primary explanations were proposed for the expansion. One was Lemaître's Big Bang theory, advocated and developed by George Gamow. The other explanation was Fred Hoyle's steady state model in which new matter is created as the galaxies move away from each other. In this model, the universe is roughly the same at any point in time. The lightest chemical elements, primarily hydrogen and helium, were created during the Big Bang through the process of nucleosynthesis. In a sequence of stellar nucleosynthesis reactions, smaller atomic nuclei are then combined into larger atomic nuclei, ultimately forming stable iron group elements such as iron and nickel, which have the highest nuclear binding energies. The net process results in a later energy release, meaning subsequent to the Big Bang. Such reactions of nuclear particles can lead to sudden energy releases from cataclysmic variable stars such as novae. Gravitational collapse of matter into black holes also powers the most energetic processes, generally seen in the nuclear regions of galaxies, forming quasars and active galaxies. Cosmologists cannot explain all cosmic phenomena exactly, such as those related to the accelerating expansion of the universe, using conventional forms of energy. Instead, cosmologists propose a new form of energy called dark energy that permeates all space. One hypothesis is that dark energy is just the vacuum energy, a component of empty space that is associated with the virtual particles that exist due to the uncertainty principle. Within the standard cosmological model, the equations of motion governing the universe as a whole are derived from general relativity with a small, positive cosmological constant. The solution is an expanding universe; due to this expansion, the radiation and matter in the universe cool down and become diluted. At first, the expansion is slowed down by gravitation attracting the radiation and matter in the universe. However, as these become diluted, the cosmological constant becomes more dominant and the expansion of the universe starts to accelerate rather than decelerate. In our universe this happened billions of years ago. During the earliest moments of the universe the average energy density was very high, making knowledge of particle physics critical to understanding this environment. Hence, scattering processes and decay of unstable elementary particles are important for cosmological models of this period. is roughly equal to the age of the universe at each point in time. The early, hot universe appears to be well explained by the Big Bang from roughly 10−33 seconds onwards, but there are several problems. One is that there is no compelling reason, using current particle physics, for the universe to be flat, homogeneous, and isotropic (see the cosmological principle). Moreover, grand unified theories of particle physics suggest that there should be magnetic monopoles in the universe, which have not been found. These problems are resolved by a brief period of cosmic inflation, which drives the universe to flatness, smooths out anisotropies and inhomogeneities to the observed level, and exponentially dilutes the monopoles. The physical model behind cosmic inflation is extremely simple, but it has not yet been confirmed by particle physics, and there are difficult problems reconciling inflation and quantum field theory. [vague] Some cosmologists think that string theory and brane cosmology will provide an alternative to inflation. Big Bang nucleosynthesis is the theory of the formation of the elements in the early universe. It finished when the universe was about three minutes old and its temperature dropped below that at which nuclear fusion could occur. Big Bang nucleosynthesis had a brief period during which it could operate, so only the very lightest elements were produced. Starting from hydrogen ions (protons), it principally produced deuterium, helium-4, and lithium. Other elements were produced in only trace abundances. The basic theory of nucleosynthesis was developed in 1948 by George Gamow, Ralph Asher Alpher, and Robert Herman. It was used for many years as a probe of physics at the time of the Big Bang, as the theory of Big Bang nucleosynthesis connects the abundances of primordial light elements with the features of the early universe. Specifically, it can be used to test the equivalence principle, to probe dark matter, and test neutrino physics. Some cosmologists have proposed that Big Bang nucleosynthesis suggests there is a fourth "sterile" species of neutrino. The cosmic microwave background is radiation left over from decoupling after the epoch of recombination when neutral atoms first formed. At this point, radiation produced in the Big Bang stopped Thomson scattering from charged ions. The radiation, first observed in 1965 by Arno Penzias and Robert Woodrow Wilson, has a perfect thermal black-body spectrum. It has a temperature of 2.7 kelvins today and is isotropic to one part in 105. Cosmological perturbation theory, which describes the evolution of slight inhomogeneities in the early universe, has allowed cosmologists to precisely calculate the angular power spectrum of the radiation, and it has been measured by the recent satellite experiments (COBE and WMAP) and many ground and balloon-based experiments (such as Degree Angular Scale Interferometer, Cosmic Background Imager, and Boomerang). One of the goals of these efforts is to measure the basic parameters of the Lambda-CDM model with increasing accuracy, as well as to test the predictions of the Big Bang model and look for new physics. The results of measurements made by WMAP, for example, have placed limits on the neutrino masses. On March 17, 2014, astronomers of the BICEP2 Collaboration announced the apparent detection of B-mode polarization of the CMB, considered to be evidence of primordial gravitational waves that are predicted by the theory of inflation to occur during the earliest phase of the Big Bang. However, later that year the Planck collaboration provided a more accurate measurement of cosmic dust, concluding that the B-mode signal from dust is the same strength as that reported from BICEP2. On January 30, 2015, a joint analysis of BICEP2 and Planck data was published and the European Space Agency announced that the signal can be entirely attributed to interstellar dust in the Milky Way. Evidence from Big Bang nucleosynthesis, the cosmic microwave background, structure formation, and galaxy rotation curves suggests that about 23% of the mass of the universe consists of non-baryonic dark matter, whereas only 4% consists of visible, baryonic matter. The gravitational effects of dark matter are well understood, as it behaves like a cold, non-radiative fluid that forms haloes around galaxies. Dark matter has never been detected in the laboratory, and the particle physics nature of dark matter remains completely unknown. Without observational constraints, there are a number of candidates, such as a stable supersymmetric particle, a weakly interacting massive particle, a gravitationally-interacting massive particle, an axion, and a massive compact halo object. Alternatives to the dark matter hypothesis include a modification of gravity at small accelerations (MOND) or an effect from brane cosmology. A better understanding of dark energy is likely to solve the problem of the ultimate fate of the universe. In the current cosmological epoch, the accelerated expansion due to dark energy is preventing structures larger than superclusters from forming. It is not known whether the acceleration will continue indefinitely, perhaps even increasing until a big rip, or whether it will eventually reverse, lead to a big freeze, or follow some other scenario. Gravitational waves are ripples in the curvature of spacetime that propagate as waves at the speed of light, generated in certain gravitational interactions that propagate outward from their source. Gravitational-wave astronomy is an emerging branch of observational astronomy which aims to use gravitational waves to collect observational data about sources of detectable gravitational waves such as binary star systems composed of white dwarfs, neutron stars, and black holes; and events such as supernovae, and the formation of the early universe shortly after the Big Bang. In 2016, the LIGO Scientific Collaboration and Virgo Collaboration teams announced that they had made the first observation of gravitational waves, originating from a pair of merging black holes using the Advanced LIGO detectors. On June 15, 2016, a second detection of gravitational waves from coalescing black holes was announced. Besides LIGO, many other gravitational-wave observatories (detectors) are under construction. Detection of cosmic rays with energies above the GZK cutoff, and whether it signals a failure of special relativity at high energies. The increasing complexity of universal structures, an example being the progressively greater energy rate density. ^ For an overview, see George FR Ellis (2006). "Issues in the Philosophy of Cosmology". In Jeremy Butterfield & John Earman (ed.). Philosophy of Physics (Handbook of the Philosophy of Science) 3 volume set. North Holland. arXiv:astro-ph/0602280. Bibcode:2006astro.ph..2280E. ISBN 978-0-444-51560-5. ^ "An Open Letter to the Scientific Community as published in New Scientist, May 22, 2004". cosmologystatement.org. 1 April 2014. Archived from the original on 1 April 2014. Retrieved 27 September 2017. ^ Beringer, J.; et al. (Particle Data Group) (2012). "2013 Review of Particle Physics" (PDF). Phys. Rev. D. 86 (1): 010001. Bibcode:2012PhRvD..86a0001B. doi:10.1103/PhysRevD.86.010001. ^ "Nobel Prize Biography". Nobel Prize. Retrieved 25 February 2011. ^ a b Liddle, A. (26 May 2003). An Introduction to Modern Cosmology. Wiley. p. 51. ISBN 978-0-470-84835-7. ^ Vilenkin, Alex (2007). Many worlds in one : the search for other universes. New York: Hill and Wang, A division of Farrar, Straus and Giroux. p. 19. ISBN 978-0-8090-6722-0. ^ Jones, Mark; Lambourne, Robert (2004). An introduction to galaxies and cosmology. Milton Keynes Cambridge, UK; New York: Open University Cambridge University Press. p. 228. ISBN 978-0-521-54623-2. ^ Jones, Mark; Lambourne, Robert (2004). An introduction to galaxies and cosmology. Milton Keynes Cambridge, UK; New York: Open University Cambridge University Press. p. 232. ISBN 978-0-521-54623-2. ^ a b c Overbye, Dennis (17 March 2014). 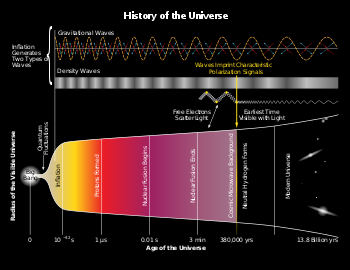 "Detection of Waves in Space Buttresses Landmark Theory of Big Bang". The New York Times. Retrieved 17 March 2014. ^ Ali, Ahmed Faraq (4 February 2015). "Cosmology from quantum potential". Physics Letters B. 741 (2015): 276–279. arXiv:1404.3093. Bibcode:2015PhLB..741..276F. doi:10.1016/j.physletb.2014.12.057. ^ Das, Saurya; Bhaduri, Rajat K (21 May 2015). "Dark matter and dark energy from a Bose–Einstein condensate". Classical and Quantum Gravity. 32 (10): 105003. arXiv:1411.0753. Bibcode:2015CQGra..32j5003D. doi:10.1088/0264-9381/32/10/105003. ^ a b Burles, Scott; Nollett, Kenneth M.; Turner, Michael S. (May 2001). "Big Bang Nucleosynthesis Predictions for Precision Cosmology". The Astrophysical Journal. 552 (1): L1–L5. arXiv:astro-ph/0010171. Bibcode:2001ApJ...552L...1B. doi:10.1086/320251. ^ Frautschi, S. (13 August 1982). "Entropy in an expanding universe". Science. 217 (4560): 593–599. Bibcode:1982Sci...217..593F. doi:10.1126/science.217.4560.593. PMID 17817517. ^ Frieman, Joshua A.; Turner, Michael S.; Huterer, Dragan (2008). "Dark Energy and the Accelerating Universe". Annual Review of Astronomy & Astrophysics. 46 (1): 385–432. arXiv:0803.0982. Bibcode:2008ARA&A..46..385F. doi:10.1146/annurev.astro.46.060407.145243. ^ e.g. Liddle, A. (2003). An Introduction to Modern Cosmology. Wiley. ISBN 978-0-470-84835-7. This argues cogently "Energy is always, always, always conserved." ^ P. Ojeda; H. Rosu (June 2006). "Supersymmetry of FRW barotropic cosmologies". Internat. J. Theoret. Phys. 45 (6): 1191–1196. arXiv:gr-qc/0510004. Bibcode:2006IJTP...45.1152R. doi:10.1007/s10773-006-9123-2. ^ Springel, Volker; Frenk, Carlos S.; White, Simon D.M. (2006). "The large-scale structure of the Universe". Nature. 440 (7088): 1137–1144. arXiv:astro-ph/0604561. Bibcode:2006Natur.440.1137S. CiteSeerX 10.1.1.255.8877. doi:10.1038/nature04805. PMID 16641985. ^ "Cosmic Detectives". The European Space Agency (ESA). 2 April 2013. Retrieved 25 April 2013. ^ Guth, Alan H. (15 January 1981). "Inflationary universe: A possible solution to the horizon and flatness problems". Physical Review D. 23 (2): 347–356. Bibcode:1981PhRvD..23..347G. doi:10.1103/PhysRevD.23.347. ^ Pogosian, Levon; Tye, S.-H. Henry; Wasserman, Ira; Wyman, Mark (2003). "Observational constraints on cosmic string production during brane inflation". Physical Review D. 68 (2): 023506. arXiv:hep-th/0304188. Bibcode:2003PhRvD..68b3506P. doi:10.1103/PhysRevD.68.023506. ^ Pandolfi, Stefania (30 January 2017). "New source of asymmetry between matter and antimatter". CERN. Retrieved 9 April 2018. ^ Peebles, Phillip James Edwin (April 2014). "Discovery of the hot Big Bang: What happened in 1948". The European Physical Journal H. 39 (2): 205–223. arXiv:1310.2146. Bibcode:2014EPJH...39..205P. doi:10.1140/epjh/e2014-50002-y. ^ Lucente, Michele; Abada, Asmaa; Arcadi, Giorgio; Domcke, Valerie (March 2018). "Leptogenesis, dark matter and neutrino masses". arXiv:1803.10826 [hep-ph]. ^ Collaboration, Planck; Ade, P. A. R.; Aghanim, N.; Arnaud, M.; Ashdown, M.; Aumont, J.; Baccigalupi, C.; Banday, A. J.; Barreiro, R. B.; Bartlett, J. G.; Bartolo, N.; Battaner, E.; Battye, R.; Benabed, K.; Benoit, A.; Benoit-Levy, A.; Bernard, J. -P.; Bersanelli, M.; Bielewicz, P.; Bonaldi, A.; Bonavera, L.; Bond, J. R.; Borrill, J.; Bouchet, F. R.; Boulanger, F.; Bucher, M.; Burigana, C.; Butler, R. C.; Calabrese, E.; et al. (2016). "Planck 2015 Results. XIII. Cosmological Parameters". Astronomy & Astrophysics. 594 (13): A13. arXiv:1502.01589. Bibcode:2016A&A...594A..13P. doi:10.1051/0004-6361/201525830. ^ Carlisle, Camille M. (10 February 2015). "Planck Upholds Standard Cosmology". Sky & Telescope Media. Retrieved 9 April 2018. ^ a b Overbye, Dennis (25 March 2014). "Ripples From the Big Bang". The New York Times. Retrieved 24 March 2014. ^ Lamarre, Jean-Michel (2010). "The Cosmic Microwave Background". In Huber, M. C. E.; Pauluhn, A.; Culhane, J. L.; Timothy, J. G.; Wilhelm, K.; Zehnder, A. (eds.). 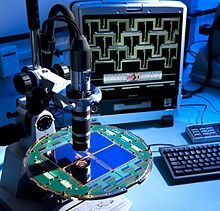 Observing Photons in Space. ISSI Scientific Reports Series. 9. pp. 149–162. Bibcode:2010ISSIR...9..149L. ^ Sievers, J. L.; et al. (2003). "Cosmological Parameters from Cosmic Background Imager Observations and Comparisons with BOOMERANG, DASI, and MAXIMA". The Astrophysical Journal. 591 (2): 599–622. arXiv:astro-ph/0205387. Bibcode:2003ApJ...591..599S. doi:10.1086/375510. ^ Hinshaw, G.; et al. (October 2013). "Nine-year Wilkinson Microwave Anisotropy Probe (WMAP) Observations: Cosmological Parameter Results". The Astrophysical Journal Supplement. 208 (2): 19. arXiv:1212.5226. Bibcode:2013ApJS..208...19H. doi:10.1088/0067-0049/208/2/19. ^ Naess, Sigurd; Hasselfield, Matthew; McMahon, Jeff; Niemack, Michael D.; et al. (October 2014). "The Atacama Cosmology Telescope: CMB polarization at 200 < l < 9000". Journal of Cosmology and Astroparticle Physics. 2014 (10): 007. arXiv:1405.5524. Bibcode:2014JCAP...10..007N. doi:10.1088/1475-7516/2014/10/007. ^ Baumann, Daniel; et al. (2009). "Probing Inflation with CMB Polarization". CMB Polarization Workshop: Theory and Foregrounds: CMBPol Mission Concept Study. American Institute of Physics Conference Series. AIP Conference Proceedings. 1141. pp. 10–120. arXiv:0811.3919. Bibcode:2009AIPC.1141...10B. doi:10.1063/1.3160885. ^ Scranton, R.; Connolly, A. J.; Nichol, R. C.; Stebbins, A.; Szapudi, I.; Eisenstein, D. J.; et al. (July 2003). "Physical Evidence for Dark Energy". arXiv:astro-ph/0307335. ^ Refregier, A. (1999). "Overview of Secondary Anisotropies of the CMB". In de Oliveira-Costa, A.; Tegmark, M. (eds.). Microwave Foregrounds. Microwave Foregrounds. ASP Conference Series. 181. p. 219. arXiv:astro-ph/9904235. Bibcode:1999ASPC..181..219R. ISBN 978-1-58381-006-4. ^ Overbye, D. (22 September 2014). "Study Confirms Criticism of Big Bang Finding". The New York Times. Retrieved 22 September 2014. ^ Heß, Steffen; Kitaura, Francisco-Shu; Gottlöber, Stefan (November 2013). "Simulating structure formation of the Local Universe". Monthly Notices of the Royal Astronomical Society. 435 (3): 2065–2076. arXiv:1304.6565. Bibcode:2013MNRAS.435.2065H. doi:10.1093/mnras/stt1428. ^ Cole, Shaun; Percival, Will J.; Peacock, John A.; Norberg, Peder; Baugh, Carlton M.; Frenk, Carlos S.; et al. (2005). "The 2dF Galaxy Redshift Survey: power-spectrum analysis of the final data set and cosmological implications". Monthly Notices of the Royal Astronomical Society. 362 (2): 505–534. arXiv:astro-ph/0501174. Bibcode:2005MNRAS.362..505C. doi:10.1111/j.1365-2966.2005.09318.x. ^ Percival, Will J.; et al. (2007). "The Shape of the Sloan Digital Sky Survey Data Release 5 Galaxy Power Spectrum". The Astrophysical Journal. 657 (2): 645–663. arXiv:astro-ph/0608636. Bibcode:2007ApJ...657..645P. doi:10.1086/510615. ^ Kuhlen, Michael; Vogelsberger, Mark; Angulo, Raul (November 2012). "Numerical simulations of the dark universe: State of the art and the next decade". Physics of the Dark Universe. 1 (1–2): 50–93. arXiv:1209.5745. Bibcode:2012PDU.....1...50K. doi:10.1016/j.dark.2012.10.002. ^ Weinberg, David H.; Davé, Romeel; Katz, Neal; Kollmeier, Juna A. (May 2003). "The Lyman-α Forest as a Cosmological Tool". In Holt, S.H. ; Reynolds, C. S. (eds.). AIP Conference Proceedings. The Emergence of Cosmic Structure. AIP Conference Series. 666. pp. 157–169. arXiv:astro-ph/0301186. Bibcode:2003AIPC..666..157W. CiteSeerX 10.1.1.256.1928. doi:10.1063/1.1581786. ^ Furlanetto, Steven R.; Oh, S. Peng; Briggs, Frank H. (October 2006). "Cosmology at low frequencies: The 21 cm transition and the high-redshift Universe". Physics Reports. 433 (4–6): 181–301. arXiv:astro-ph/0608032. Bibcode:2006PhR...433..181F. CiteSeerX 10.1.1.256.8319. doi:10.1016/j.physrep.2006.08.002. ^ Munshi, Dipak; Valageas, Patrick; van Waerbeke, Ludovic; Heavens, Alan (2008). "Cosmology with weak lensing surveys". Physics Reports. 462 (3): 67–121. arXiv:astro-ph/0612667. Bibcode:2008PhR...462...67M. CiteSeerX 10.1.1.337.3760. doi:10.1016/j.physrep.2008.02.003. ^ Klasen, M.; Pohl, M.; Sigl, G. (November 2015). "Indirect and direct search for dark matter". Progress in Particle and Nuclear Physics. 85: 1–32. arXiv:1507.03800. Bibcode:2015PrPNP..85....1K. doi:10.1016/j.ppnp.2015.07.001. ^ Perlmutter, Saul; Turner, Michael S.; White, Martin (1999). "Constraining Dark Energy with Type Ia Supernovae and Large-Scale Structure". Physical Review Letters. 83 (4): 670–673. arXiv:astro-ph/9901052. Bibcode:1999PhRvL..83..670P. doi:10.1103/PhysRevLett.83.670. ^ Adler, Ronald J.; Casey, Brendan; Jacob, Ovid C. (July 1995). "Vacuum catastrophe: An elementary exposition of the cosmological constant problem". American Journal of Physics. 63 (7): 620–626. Bibcode:1995AmJPh..63..620A. doi:10.1119/1.17850. ^ Siegfried, Tom (11 August 2006). "A 'Landscape' Too Far?". Science. 313 (5788): 750–753. doi:10.1126/science.313.5788.750. PMID 16902104. ^ Sahni, Varun (2002). "The cosmological constant problem and quintessence". Classical and Quantum Gravity. 19 (13): 3435–3448. arXiv:astro-ph/0202076. Bibcode:2002CQGra..19.3435S. doi:10.1088/0264-9381/19/13/304. ^ Nojiri, S.; Odintsov, S. D. (2006). "Introduction to Modified Gravity and Gravitational Alternative for Dark Energy". International Journal of Geometric Methods in Modern Physics. 04 (1): 115–146. arXiv:hep-th/0601213. Bibcode:2006hep.th....1213N. doi:10.1142/S0219887807001928. ^ Fernández-Jambrina, L. (September 2014). "Grand rip and grand bang/crunch cosmological singularities". Physical Review D. 90 (6): 064014. arXiv:1408.6997. Bibcode:2014PhRvD..90f4014F. doi:10.1103/PhysRevD.90.064014. ^ Colpi, Monica; Sesana, Alberto (2017). "Gravitational Wave Sources in the Era of Multi-Band Gravitational Wave Astronomy". In Gerard, Augar; Eric, Plagnol (eds.). An Overview of Gravitational Waves: Theory, Sources and Detection. An Overview of Gravitational Waves: Theory. pp. 43–140. arXiv:1610.05309. Bibcode:2017ogw..book...43C. doi:10.1142/9789813141766_0002. ISBN 978-981-314-176-6. ^ "Gravitational waves detected 100 years after Einstein's prediction". www.nsf.gov. National Science Foundation. Retrieved 11 February 2016. ^ Overbye, Dennis (15 June 2016). "Scientists Hear a Second Chirp From Colliding Black Holes". The New York Times. Retrieved 15 June 2016. ^ Kovetz, Ely D. (2017). "Probing Primordial Black Hole Dark Matter with Gravitational Waves". Physical Review Letters. 119 (13): 131301. arXiv:1705.09182. Bibcode:2017PhRvL.119m1301K. doi:10.1103/PhysRevLett.119.131301. PMID 29341709. ^ Takeda, M.; et al. (10 August 1998). "Extension of the Cosmic-Ray Energy Spectrum beyond the Predicted Greisen-Zatsepin-Kuz'min Cutoff". Physical Review Letters. 81 (6): 1163–1166. arXiv:astro-ph/9807193. Bibcode:1998PhRvL..81.1163T. doi:10.1103/PhysRevLett.81.1163. ^ Turyshev, Slava G. (2008). "Experimental Tests of General Relativity". Annual Review of Nuclear and Particle Science. 58 (1): 207–248. arXiv:0806.1731. Bibcode:2008ARNPS..58..207T. doi:10.1146/annurev.nucl.58.020807.111839. ^ Uzan, Jean-Philippe (March 2011). "Varying Constants, Gravitation and Cosmology". Living Reviews in Relativity. 14 (1): 2. arXiv:1009.5514. Bibcode:2011LRR....14....2U. doi:10.12942/lrr-2011-2. PMC 5256069. PMID 28179829. ^ Chaisson, Eric (1 January 1987). "The life ERA: cosmic selection and conscious evolution". Faculty Publications. Bibcode:1987lecs.book.....C.
Brian Greene (2005). The Fabric of the Cosmos. Penguin Books Ltd. ISBN 978-0-14-101111-0. Alan Guth (1997). The Inflationary Universe: The Quest for a New Theory of Cosmic Origins. Random House. ISBN 978-0-224-04448-6. Hawking, Stephen W. (1988). A Brief History of Time: From the Big Bang to Black Holes. Bantam Books, Inc. ISBN 978-0-553-38016-3. Hawking, Stephen W. (2001). The Universe in a Nutshell. Bantam Books, Inc. ISBN 978-0-553-80202-3. Simon Singh (2005). Big Bang: The Origin of the Universe. Fourth Estate. Bibcode:2004biba.book.....S. ISBN 978-0-00-716221-5. Steven Weinberg (1993) [First published 1978]. The First Three Minutes. Basic Books. ISBN 978-0-465-02437-7. Cheng, Ta-Pei (2005). Relativity, Gravitation and Cosmology: a Basic Introduction. Oxford and New York: Oxford University Press. ISBN 978-0-19-852957-6. Introductory cosmology and general relativity without the full tensor apparatus, deferred until the last part of the book. Dodelson, Scott (2003). Modern Cosmology. Academic Press. ISBN 978-0-12-219141-1. An introductory text, released slightly before the WMAP results. Grøn, Øyvind; Hervik, Sigbjørn (2007). Einstein's General Theory of Relativity with Modern Applications in Cosmology. New York: Springer. ISBN 978-0-387-69199-2. Harrison, Edward (2000). Cosmology: the science of the universe. Cambridge University Press. ISBN 978-0-521-66148-5. For undergraduates; mathematically gentle with a strong historical focus. Kutner, Marc (2003). Astronomy: A Physical Perspective. Cambridge University Press. ISBN 978-0-521-52927-3. An introductory astronomy text. Kolb, Edward; Michael Turner (1988). The Early Universe. Addison-Wesley. ISBN 978-0-201-11604-5. The classic reference for researchers. Liddle, Andrew (2003). An Introduction to Modern Cosmology. John Wiley. ISBN 978-0-470-84835-7. Cosmology without general relativity. Liddle, Andrew; David Lyth (2000). Cosmological Inflation and Large-Scale Structure. Cambridge. ISBN 978-0-521-57598-0. An introduction to cosmology with a thorough discussion of inflation. Padmanabhan, T. (1993). Structure formation in the universe. Cambridge University Press. ISBN 978-0-521-42486-8. Discusses the formation of large-scale structures in detail. Peacock, John (1998). Cosmological Physics. Cambridge University Press. ISBN 978-0-521-42270-3. An introduction including more on general relativity and quantum field theory than most. Peebles, P. J. E. (1993). Principles of Physical Cosmology. Princeton University Press. ISBN 978-0-691-01933-8. Strong historical focus. Peebles, P. J. E. (1980). The Large-Scale Structure of the Universe. Princeton University Press. ISBN 978-0-691-08240-0. The classic work on large-scale structure and correlation functions. Rees, Martin (2002). New Perspectives in Astrophysical Cosmology. Cambridge University Press. ISBN 978-0-521-64544-7. Weinberg, Steven (1971). Gravitation and Cosmology. John Wiley. ISBN 978-0-471-92567-5. A standard reference for the mathematical formalism. Weinberg, Steven (2008). Cosmology. Oxford University Press. ISBN 978-0-19-852682-7. Benjamin Gal-Or, "Cosmology, Physics and Philosophy", Springer Verlag, 1981, 1983, 1987, ISBN 0-387-90581-2, 0-387-96526-2. Origins, Nova Online – Provided by PBS. George Musser (February 2004). "Four Keys to Cosmology". Scientific American. Scientific American. Retrieved 22 March 2015. Cliff Burgess; Fernando Quevedo (November 2007). "The Great Cosmic Roller-Coaster Ride". Scientific American (print). pp. 52–59. (subtitle) Could cosmic inflation be a sign that our universe is embedded in a far vaster realm?